Is “disability” Just An Ableist Word? Most of those that carry on in daily activities without using an aide have a skewed vision of those that use aids to walk, see, hear, eat, etc. We call them “disabled”. And what does that conjure in the mind? Someone who can’t do something. Could I dunk a basketball like LeBron James? On a 10’ rim, no way. A torn left ACL and a torn right Achilles & the ensuing operations have limited those types of abilities. Give me an 8’ rim, however, and I’ll at least give you a good show. And that’s precisely it. Give those that use aides of whatever type their “8’ rim”, and they can do whatever the pros do, and in many cases, do it better. We haven’t lost track of that here at Spectrum. We have a respectable history of working with the Stout Vocational Rehabilitation Institute to produce innovations that level the playing field. 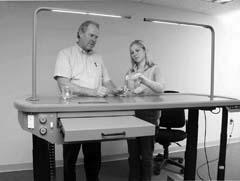 Our latest collaboration: a workstation for those with physical limitations. It is aimed at those pursuing math and science careers, but is capable of so much more. Please read the official Dunn County article for more information. As a manufacturer, do we have a perfect plan to change ableist perceptions of the word “disabled’? Tough question. But we continue to use our research and development resources to find that next best 8’ rim. Many thanks go to Jeff Annis and WHEELIE cATHOLIC for collaboration and inspiration, respectively. What does that 8’ rim resemble in your world?